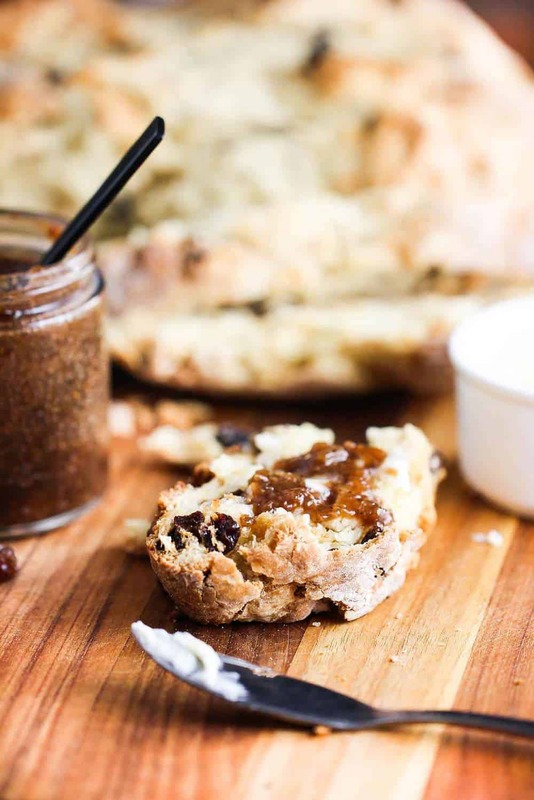 Boy, oh boy, this delightful Irish Soda Bread recipe is something very special. Our version strays a little from the truly traditional Irish recipe and has just a touch more sweetness. This is by no means overly sugary, but we think a little dash of sweetness just makes this bread so cozy and delicious. 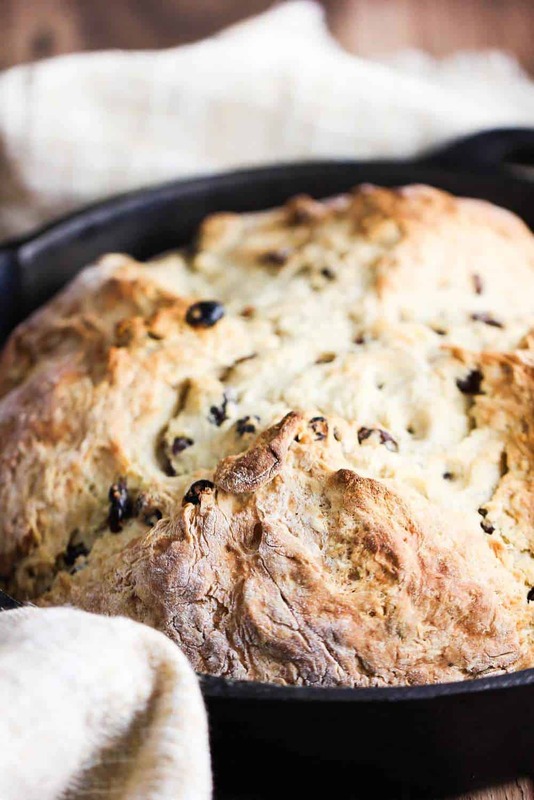 We love the taste of this Irish Soda Bread, but we also love how easy it is to prepare. 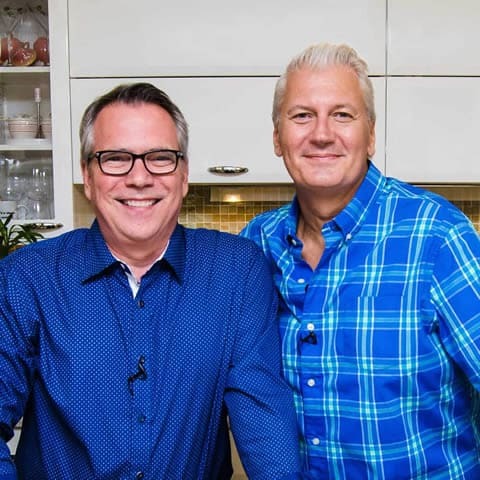 Watch us show you how easy it is to make Irish Soda Bread in your very own kitchen! It’s important to use really cold butter when ‘cutting’ it into the flour. I love to use a pastry cutter to break the cold butter into little balls. As the dough bakes, the cold pieces of butter will release steam and allow for a wonderfully moist and fluffy inside. You can easily order a pastry cutter by clicking here and have it delivered very fast! This is without a doubt one of my all-time favorite quick breads to make. The baking soda is what gives it its name (no surprise there), but you might be surprised at just how simple and satisfying this bread is to make and serve. The batter is dense and quite sticky, but when bakes, it rises beautifully, and becomes airy on the inside, with a nice crusty exterior. I find that after I roll the sticky dough into a ball, an oven-safe skillet, such as my trusty cast iron skillet, works perfectly as vessel to bake the bread! You just can’t believe the smell as you pull this beautiful loaf of bread out of the oven. And it’s just so gorgeous, too! Ah, we love you Irish Soda Bread! This bread is truly something magical. And it is so simple to make. Delicious warm, fresh out of the oven, or at room temperature. A smear of soft butter and a little jam is an ideal addition. This is perfect for St. Patrick’s Day…or anytime of the year you are in the mood for some incredibly delicious and hearty homemade bread. 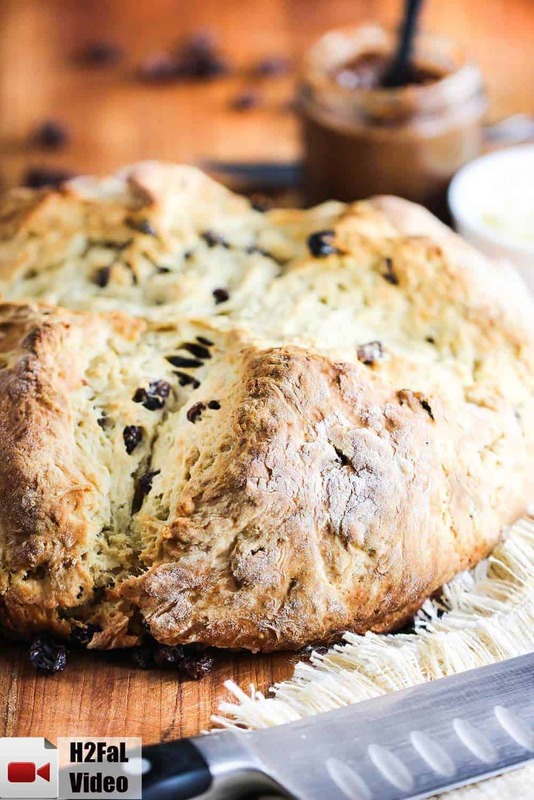 Now, let’s go ahead and make this incredible Irish Soda Bread recipe! You are going to love it very much! You’ll be thanking your lucky charms, for sure! 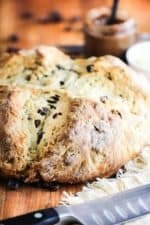 This Irish Soda Bread recipe is a classic and is so comforting and just down-right delicious. It's a bit sweeter than the true original Irish version, and the addition of raisins is probably an American influence, but boy oh boy, is it good. And not hard to make at all. I love baking this in my cast iron skillet, but any ovenproof pan will do, including a baking dish. Pre-heat oven to 425 F.
Lightly grease an oven-safe skillet (cast iron is perfect) or baking sheet (the dough may spread a little more) with the cooking spray or some softened butter. In a medium bowl, whisk together the buttermilk and egg and then set aside. In a large bowl, whisk together the flour, sugar, baking soda, and salt. You can whisk with a fork for about 30 seconds, and you'll be set. Cut the chilled butter into cubes with a sharp knife. Using a pastry cutter, or two forks or knives, or your fingers (working quickly), cut the butter into the flour mixture. Continue to work the dough until the butter begins to resemble the size of peas. Now fold in the raisins with a wooden spoon. Make a well in the center of the dry ingredients and pour in the buttermilk mixture. 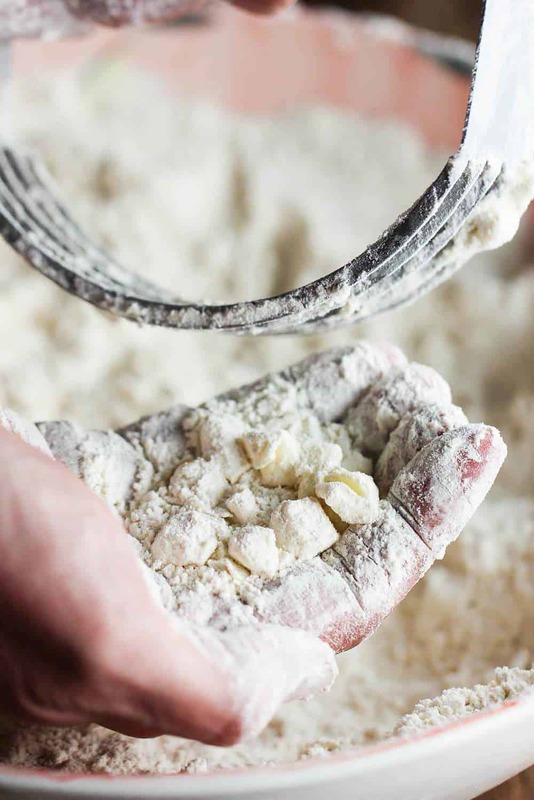 Gently fold the dough together with your wooden spoon until all pockets of flour are absorbed into the batter. 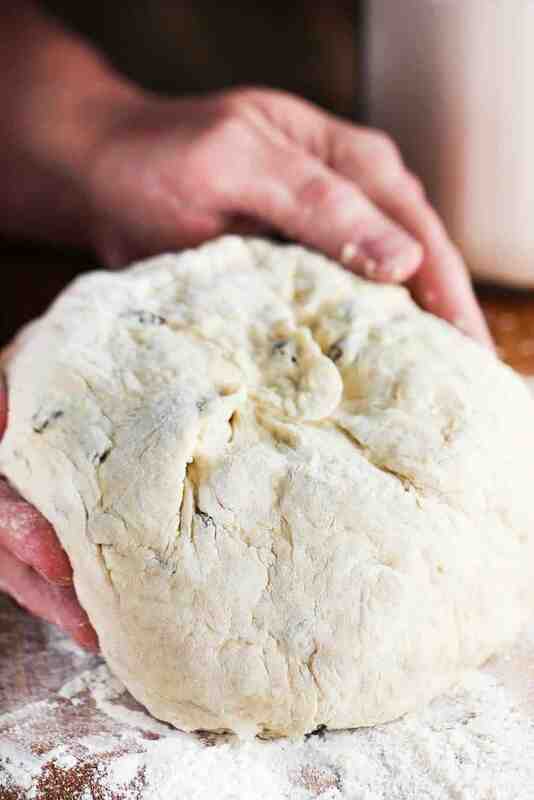 With floured hands, work the dough into a ball. The dough will be sticky and stiff. Turn the dough out onto a floured surface and knead the dough for about 30 seconds. If the dough is just too sticky to work, then add a little more flour. Don't over knead! Very important! Transfer the dough to the prepared skillet or pan. Using a sharp knife, score a large 'X' on the top. Bake until the bread is golden brown and the center is cooked through, about 45 minutes. If the bread appears to be browning too much, then add a piece of aluminum foil over the top about halfway through baking. Remove skillet/pan from oven and allow bread to cool for 10 minutes. 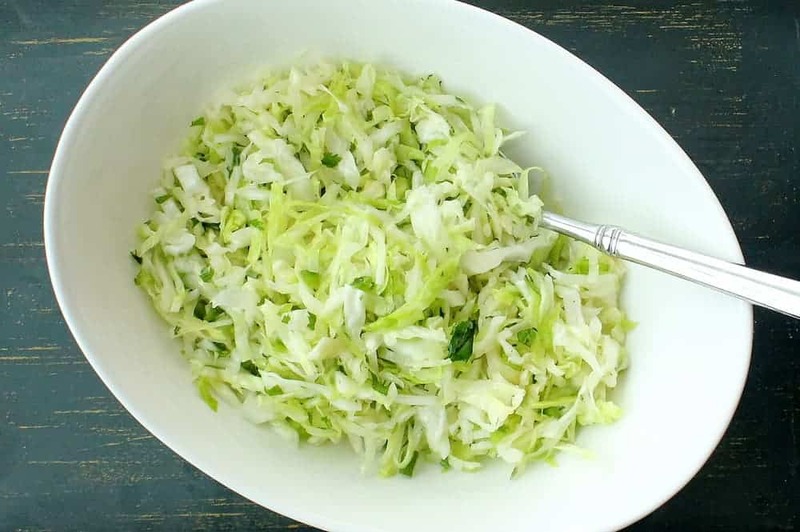 Slice and serve warm or at room temperature with softened butter and desired toppings. I LoveLoveLove you zany guys!! Hi Kathie, yes indeed, caraway is a wonderful addition to soda bread. So good! !